Canva offers users, whether novice designers or professional graphic artists, with a simple yet robust online design platform that can turn any idea into a powerful, stunning designs and graphics easily and quickly. It is an ideal design tool and content creation platform for those who are not graphically inclined. With Canva, companies and organizations are able to address common issues that plague content marketing efforts – “Producing Engaging Content” and “Producing Content Consistently”. Canva has the tools and functionalities that enable users to create awesome, appealing, and relevant content and the capabilities to make the process easy and seamless. If you are interested in Canva it could also be a good idea to analyze other subcategories of Best Graphic Design Software gathered in our base of B2B software reviews. Organizations have diverse needs and requirements and no software solution can be just right in such a scenario. It is pointless to try to find a perfect off-the-shelf software product that fulfills all your business requirements. The wise thing to do would be to modify the solution for your special wants, staff member skill levels, budget, and other elements. For these reasons, do not hasten and invest in well-publicized leading systems. Though these may be widely used, they may not be the perfect fit for your unique wants. Do your research, check out each short-listed application in detail, read a few Canva reviews, call the seller for explanations, and finally choose the product that presents what you require. We realize that when you make a decision to buy Graphic Design Software it’s important not only to see how experts evaluate it in their reviews, but also to find out if the real people and companies that buy it are actually satisfied with the product. That’s why we’ve created our behavior-based Customer Satisfaction Algorithm™ that gathers customer reviews, comments and Canva reviews across a wide range of social media sites. The data is then presented in an easy to digest form showing how many people had positive and negative experience with Canva. With that information at hand you should be equipped to make an informed buying decision that you won’t regret. What are Canva pricing details? 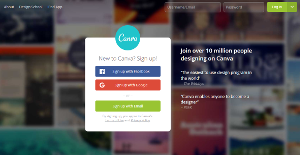 What integrations are available for Canva? Pros: Canva is one of my favorite tools when it comes to designing. Its interface is user friendly and easy to use. It has pre-defined sizes that fit into various media templates. You can find internal database for royalty-free photo and illustrations that cost $1 or you can even use the free ones. It offers books and tutorials for designing. Cons: They could improve the interface becuase it has some performance issues and what I mean by that it cannot be adapted to monitor screen and I cannot collapse the lateral menus. Pros: The robust templated library allows quick work of basic design tasks. Cons: The design interface is very glitchy. The latest version of Chome (70.0.3538.110 (Official Build) (64-bit)) has stopped loading web fonts on OSX Sierra, and I can NOT see my font changes. Literally ruins any design functionality.Also, some of my designs have stopped loading in all web browsers. Work just GONE. The support team has refused to contact me after 3 attempts at an SOS support ticket. These kinds of issues on deadlines RUIN the whole service. If you're a professional marketer or work on deadlines, this software is NOT RELIABLE and I would steer clear. The robust templated library allows quick work of basic design tasks. If you need more information about Canva or you simply have a question let us know what you need and we’ll forward your request directly to the vendor.